While I’m all for slow fashion, I don’t know about waiting eight YEARS for a piece of clothing. 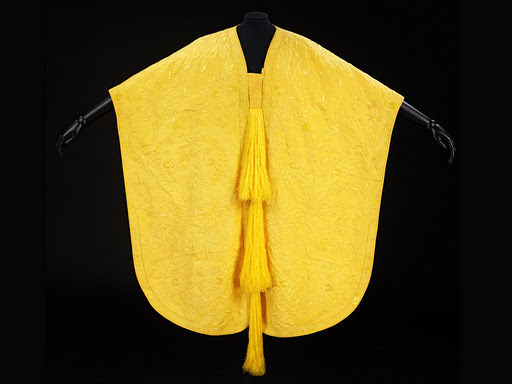 But that’s what it took to create this golden silk cape. Eight years, and a MILLION golden orb spiders. I quite like spiders, so that doesn’t freak me out, but the thought of how time consuming this must have been does. This is an amazing story, so please read more about it here (where the photo is from also, and you can see the cape on a model as well as close ups of the intricate embroidery which decorates it) and if you are in the UK, please, PLEASE do not miss your chance to see it at the Victoria & Albert museum where it is currently on show. Incredible!! That last picture of the silk extraction made me cringe, though!